The theological argument over Mormonism as Christianity is above my pay grade. I learned a lot about Mormonism just today listening to On Being with Krista Tippett. Krista interviewed Joanna Brooks, professor of literature at San Diego State and blogger as “Ask Mormon Girl.” Brooks talked about Mormonism, its differences with other Christians, and the wide range of Mormon thought, running from stern ultraconservative orthodoxy to pro-gay rights pro-feminist liberalism. She’s worth listening to, at the OnBeing.org website. This entry was posted on October 25, 2011 at 12:18 am and is filed under Ethics-general, Politics, Retail, Tolerance. You can follow any responses to this entry through the RSS 2.0 feed. You can leave a response, or trackback from your own site. Great message. The key is whether or not he is qualified. By the way, the book you are using as a picture is strongly agreeing with your point. The Hewitt book is old-fashioned political hagiography. 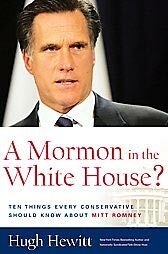 While i’m not a Romney fan (if you can’t tell), the book cover illustrates my point: his religion isn’t the issue. “Let Romney lose because his opponent is better, not because of ugly religious bigotry � Ethics Bob” was indeed quite enjoyable and beneficial!